The Shadow of Arms (translated by Chun Kyung-ja) is, rather unusually for a Korean book, set outside the Korean peninsula, taking us further South-West. The novel takes place during the Vietnam War, where we meet a Korean soldier Ahn Yong-kyu, who is whisked out of the trenches to the city of Da Nang. The lucky soldier has been chosen to replace a returning officer at the Joint Investigation headquarters – meaning his job has changed from hunting the Vietcong to looking for blackmarket cigarettes. The story may start in the jungle, but The Shadow of Arms is a book which mostly plays out in the city. It’s a story of Koreans in the Vietnam war, there as support for their American allies and protectors, a story many people will be unaware of. At times, it comes across as a kind of M*A*S*H* for black-market investigators, but without the humour – this is a serious book exploring serious issues. The Korean newcomer proves himself to be surprisingly adaptive, soon making a name for himself in the markets of Da Nang. While having to take part in the game in order to do his job, he’s not greedy, diving into the black market mainly to make connections. In doing so, he introduces the reader to a world of clubs, whore houses, American warehouses and back-street dealings – at which point many of you will be wondering where the war went. It is out there, though, and Hwang does take us on occasional visits to the ‘real’ Vietnam. The two other main characters in the book are Pham Quyen, a powerful Vietnamese Major, and his younger brother Pham Minh – an undercover agent for the National Liberation Front. Away from Yong-kyu and his work, it’s here we see some bloodshed amongst the corruption, receiving an insight into the mindset of both sides. While both sides have their bad points, the book certainly dwells more on the shortcomings of Americans. Certainly, an American (especially one with a personal connection to the war) might be more affected by the negative portrayal of their behaviour than I was, and there’s little about Vietcong atrocities until the end of the novel. 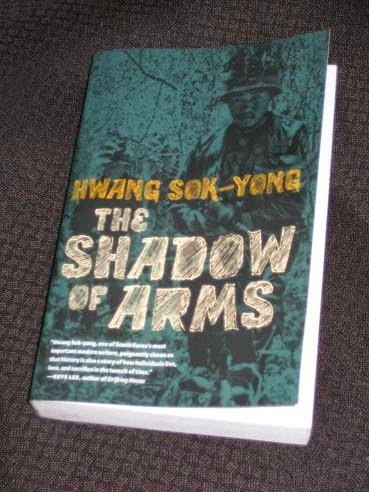 For this reason, The Shadow of Arms (based on Hwang’s own experiences in Vietnam) was a controversial book in Korea; in fact, the second part was only published after a political change of regime. The Shadow of Arms is an interesting read, but there are a few issues I had with it. The book needed a conclusion after the development of relationships between Yong-kyu and the two brothers, but it seemed a little forced, too quick and contrived. As a whole, the book suffers a little from the uneasy mix of literary fiction and thriller (similar to the issues I had last year with Ryu Murakami’s From the Fatherland, With Love). In some places, the translation also seemed a little off. There were unusual typos (‘of’ for ‘off’ in some phrasal verbs, ‘taught’ instead of ‘taut’) which perhaps should have been picked up (and may have been in a later print). I also found it hard to distinguish between the Americans and Koreans at times, although I actually found that the Vietnamese characters were much clearer and more distinct.